Lock in a great price for HI - Massada Hostel – rated 8 by recent guests! Location is very convenient, next to Mezada. Simple clean rooms and good breakfast. Location and restaurant and mattress was really comfortable. Great location, nice views, and great filling breakfast with wide variety to choose from. Proximity to Masada and nice facility with great dining! Location at the foot of Masada is the best, especially for those who want to do a sunrise hike. I stayed in the dorm and the room was so spacious and extremely clean with a huge restroom inside. Beds are quite confortable so comfort is definitely a pro in Masada Hostel. The buffet breakfast served till 9:30 (thought for those early birds eager to climb up to Masada before the sunshine and come back so they can't miss breakfast) was just AMAZING! So many stuff to choose and everything was just delicious! Location is amazing, just under Masada. Easy to climb up the hill from hostel. Breakfast was great. Room was spacious and clean. 1. Heating working properly 2. Water pressure and temperature were excellent 3. View is quite nice 4. Breakfast quality wasn't great as described, but it was alright and variety. Featuring an outdoor pool and air conditioning, HI - Massada Hostel lies at the foot of the Massada plateau on the eastern edge of the Judean Desert. It features rooms with attached bathroom and dormitories with free Wi-Fi. Accommodations at the HI - Massada Hostel is air conditioned and is fitted with a kettle, cable TV and fridge. Rooms have functional furniture and tiled floors and the bathroom is complete with toiletries and a shower. The Ein Gedi Spa and the beach are about a 15-minute drive from the property and are set on the shores of the Dead Sea. You can go for a walk along marked routes close to the desert streams. 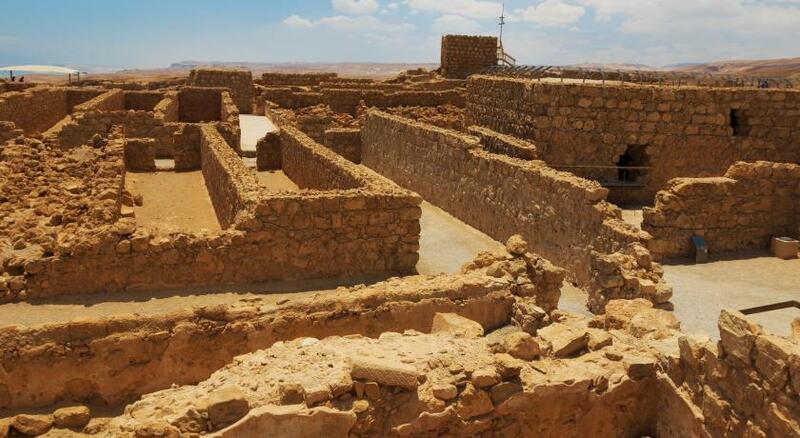 Alternatively, you can go for a panoramic moonlit tour around the Massada and Sdom marlstones. When would you like to stay at HI - Massada Hostel? Air-conditioned room with a teakettle, cable TV and fridge. It features functional furniture, tile floors and a bathroom with toiletries and shower. Wi-Fi is free. Single bed or one bunk bed in a female dormitory with air conditioning, shared bathroom and fridge. Also has a teakettle and cable TV. Wi-Fi is free. Single bed or one bunk bed in a male dormitory with air conditioning, shared bathroom and fridge. Also has a teakettle and cable TV. Wi-Fi is free. This air-conditioned room includes a cable TV, a fridge, an electric teakettle and a dining table. This single room has a dining area, electric kettle and air conditioning. House Rules HI - Massada Hostel takes special requests – add in the next step! HI - Massada Hostel accepts these cards and reserves the right to temporarily hold an amount prior to arrival. Please note that on Saturdays and the final day of Jewish holidays, check-in is after 19:00. Our room was dirty - floor hadn’t been cleaned (sunflower seeds all over floor). No hand soap provided. Amazing location and wonderful breakfast. There is no hair dryer in the room. The hostel is perfect in all aspects. The meals are fantastic and offer great value for money. The room is unbelievably spacious. There is nothing to complain about. Basketball field is lighten up during night and unfortunately people were playing until very late which is too bad since we had to wake up very early for sunrise. The place advertised they had a pool but it was closed when we were there. I got a message from them letting me know that the pool is closed a day after I could cancel it with no charge. Check before you go. Close to Massada with around a few minutes walk can reach the base, close to the dead sea, ein bokek beach with around half hour transportation can reach. The breakfast is great with variety of food choice. Breakfast was close to non edible. Employees rude and impatient for most basic interactions Floor of the room was dirty Crazy overpriced, if you go there just expect the closest place to Masada and cold bread for breakfast. It’s a convenient place to stay. There’s a bus stop right outside the hostel and the Massda national park is just right next to the hostel. Quite basic, but exactly what we expected and amazing location. Friendly staff. Sheets were a bit smelly, shower wasn't very comfortable. Nice hostel, beautiful location, simple but nice rooms, nice buffet (breakfast and dinner), nice to take a dip in the swimming pool, perfect location for the sunrise tour to Masada. Bathroom in private room smelled like urine and floor was very dirty too. Mirror had obviously not been wiped clean as it was covered with water and toothpaste spots.Large parties of very loud Israeli teens and large parties of Israeli families. Israelis in general talk loudly so it was quite noisy in the room because the entire building was marble and stone. Getting to sleep before 10 pm was impossible with all the kids yelling and laughing and music and talking in hallways and courtyards right outside rooms.Have stayed in quite a few HI hostels and none were as loud and noisy. Not anywhere even close. Noise throughout all night, lots of kids constantly running around. Unpleasant staff in the cantine. Most staff members had a low level of English. Dirty bathroom (blood on the mirror). Location is excellent for those who wish to hike to Massada for the sunrise. It is also close to the Dead Sea by car.